The Woods Hole dome has been in the news a lot in the last couple years. For those of us who love and follow the inventions of the late Buckminster Fuller, the dome has been on our radar for a while. Located in Woods Hole, Cape Cod, this dome is famous for being the first and only surviving geodesic dome in the world that Buckminster Fuller (or Bucky, as he’s affectionately called), supervised building. Prior to the Woods Hole Dome, Fuller had only built one other geodesic dome, at the iconic Ford Rotunda in Deerborn, Michigan. 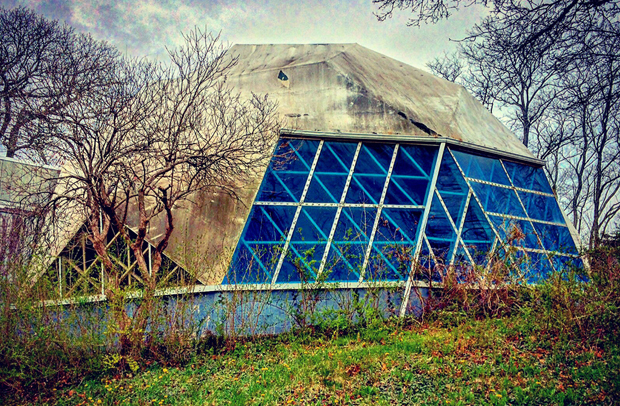 The Ford Rotunda burned down in 1962, leaving the building in Woods Hole as Fuller’s oldest surviving geodesic dome. R. Buckrninster Fuller (1895-1983) was an inventor, architect, engineer, mathmematician, poet, cosmologist, and inspired teacher. He was praised as the most innovative thinker of our time, received 43 honorary doctorates, and at me same time was dismissed as an "incomprehensible maverick. " His inventions are explained in 28 books under the heading of "Synergetics," a word he invented in a language he created because he felt that the classical language of geometry was unacceptably misleading. For example, in describing the domes, he invented a new meaning for the word, geodesic, which he saw as closer to nature than the conventional one. He patented the geodesic dome in June, 1954, where it is described as a framework that approaches a sphere in shape, composed of triangular segments built of struts fastened at their ends. The smaller the triangles, the more nearly the structure approaches spherical and the stronger it is. 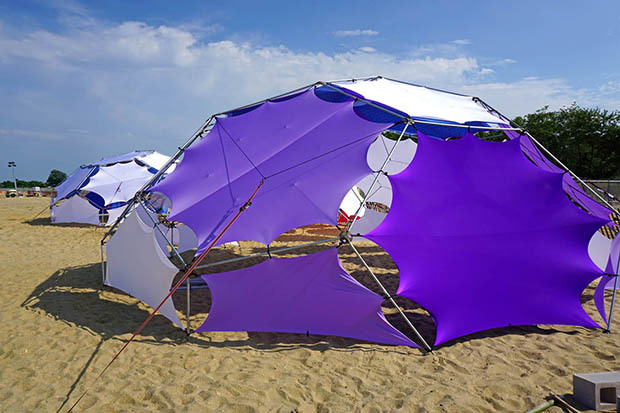 Its design is based on the light weight of structure compared with strength and the inherent stability of triangles, which are nature's only self-stabilizing pattern. The design is based on a lot of complicated math, but the idea is that by relying on the strength of of the triangle, these buildings could be made from less and cheaper materials, like plastic and aluminum instead of steel and concrete. The widely-respected architect at the forefront of architectural design in his day believed that if buildings could be made with fewer materials, then the resulting material efficiency would help save the world. In 1953, Fuller was commissioned to build the dome in Woods Hole by architect and aspiring restauranteur Gunnar Peterson. The dome was to become the posh “Dome Restaurant.” Diners could gaze through the building’s triangular windows out on onto the sea. Fuller enlisted a group of his MIT students to come to Woods Hole and erect the dome over a two-week period—and it was all done without using any scaffolding. “It’s all about the idea of using geometric forms to brace one against the other and build up the tension. They were able to put each piece in place, one by one, and they actually built quite a bit of the pieces—the frames—that were rhombus shapes. And so this dome is very unusual, because there are triangles within the rhombus. No other domes are designed this way, because, in part, this was experimental. It was not intended to last 65 years, though it has,” said local woman Nicole Goldman. Despite its Utopian aspirations, the building had some structural problems. The triangular glass panels cast beautiful reflections, but they also generated lots of heat, turning it into a greenhouse, so the owner installed mylar, blocking the ocean views. But this didn’t prevent the main problem: the building leaked. The mylar was replaced with fiberglass, and then much of the top of the outside of the Dome had to be painted with a rubber paint to stop the leaking. “Instead of cracking, it would stretch as the Dome moved. It helped, but it did not eliminate the leaking. The Dome restaurant closed in the 1990s, and since then the futuristic structure has been steadily succumbing to the elements. A few years after its sale in 2002, some plans were in the works that would have spelled certain destruction for the Dome. There was a touching outcry from the community which demanded the Dome stay intact, after a developer declared intentions of turning the property into apartments. The very same community which, at first, criticized the building before was now vehemently against it going anywhere, even in its sad state of disrepair. After a town meeting, it was ruled that, in order to build on that land, potential developers also must keep and restore the infamous structure. Nicole Goldman and some other locals have formed a group that would like to see the structure renovated as an arts centre, although the current owner of the Dome is not commenting on possible renovation plans. This story is so indicative of two themes that are very common among dome builders. First is the beauty and inspiration that domes seem to give the public at large. They are beautiful and inspiring structures, a symbol of a beautiful future of possibility. But the second is of all the issues that come with dome building. 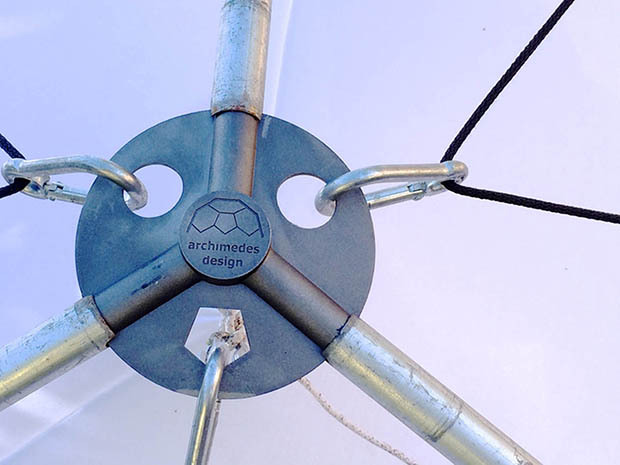 Traditional dome building has many, many problems, which is why we at Archimedes set out to build a better form of dome. The Archimedes structures were created out of years worth of trials and issues with the common format domes. There were a number of things that we wanted to change so that we could have the beautiful format of a geodesic dome without some of the issues that we were experiencing every install. The first thing we wanted to address was the speed that domes can be installed at. The common 6V and 3V domes take ages to set up. When you make a dome out of triangles you support the struts in a way that prevents shearing. In very large structures, it is a bad idea to have very long unsupported struts. The longer the struts, the easier they are to bend if shear forces are applied. Although useful when you need the structure, the biggest problem we had with these types of domes is that they are incredibly labour intensive. Although the final product is structural because the triangles support it in a way that it's fully rigid, the commitment to structure means that you're committing to hours, days, sometimes weeks to install one of these domes. We wanted shade and shelter quicker, and so we searched for an option that would go up and down in way less time. To make this possible, Archimedes came up with the idea to remove the supporting triangles and just leave in the hexagons and pentagons that make up the essence of the sphere. But if a sphere consists of any quadrilaterals or more complex polygons, they can flex if the connections at the ends are not completely rigid and this creates structural issues. So instead of trying to make the domes rigid, the Archimedes team went the other direction- we made the domes flex. Like a molecule, these domes breathe. Instead of rigid supports, they are held together through tensile integrity, a type of harnessing system that allows for a natural movement that causes the dome to maintain it's structural integrity. Picture something like a bubble. When you blow a bubble, the surface of it has a natural movement that flexes the pressure points to make it hold together as long as possible. The domes have the same type of principle. All that nerding aside, the cause of this principle is that the domes go together in a fraction of the time that most domes take, because we don't have to make our connection points rigid. Also, because of this principle, it means that you don't have to use a single tool to put it together. No nuts and bolts, no screws, no anchors. You will never have to pick up a hammer or a screw driver. It all just clicks together because it's allowed to flex. Another issue with common domes that we wanted to address was the problem of having many different types of parts that you have to keep track of. If you are making a rigid dome structure, you want the triangles that the structure is composed of to be as close to equilateral triangles as possible so that the stresses will be approximately the same on all the struts. The problem with this is that you then end up with poles of various different lengths, and it can be complicated to keep track of all the different pieces that have to go together. By cutting out the use of triangles it means that the poles of our domes are all the same size. And because the pentagons and hexagons that make up the structure are an even 2 to 1 ratio, our hubs that connect the struts are exactly the same, with 2 hex angles and 1 pent angle on every hub. That means that every single piece on these domes can literally be changed with any other piece. There's no fussing around or counting or measuring to see which one is which. Every piece is interchangeable. The thing is, these different domes are made for different purposes. The Woods Hole is permanent structure that has particular needs, just as our clients have particular needs for our domes. But one thing links us both: we’re both innovating children of the late great Buckminster Fuller. The forward-thinking American architect; someone who dared to dream, and whose work has come to symbolize a simpler, peaceful future. We can’t wait to see what innovations the Woods Hole team comes up with to solve the issues with their historical treasure! Want to donate to help save the Woodshole Dome? Head to the Highfield Hall Cultural Center's Website!